Happy Monday, friends! The sun is gloriously shining today and if it wasn't cold and snowy I might be sitting in a lawn chair right now. I have been happily awaiting the arrival of this book, "Everything Goes With Ice cream" by Koralee Teichroeb of Bluebird Notes fame. Not only is Koralee extremely talented in photography, cooking and crafting but she is truly beautiful inside and out! We have been blogging friends for a long time. I love everything she does! A daily visit to her blog brings such a ray of sunshine into my day. I was so pleased to know she was writing a book and this one does not disappoint. 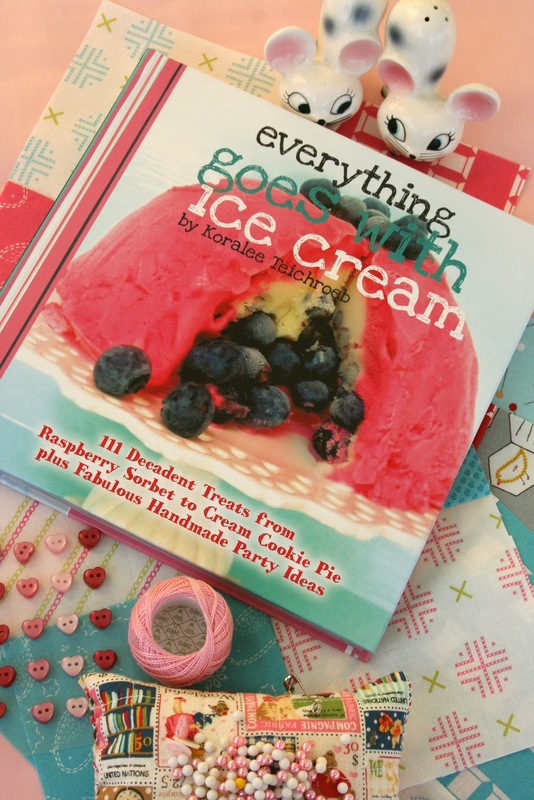 The recipes, crafts, photographs, styling…you name it, are amazing! When I went to take a picture of it I started grabbing things in my studio, the fabric I'm currently working with, the thread and buttons I love, my pincushion and my favorite vintage salt and pepper mice, and it dawned on me that they all have the same color scheme as Koralee's book! She is a girl after my own heart! What a sweet pic! Koralee's book is on my Amazon wishlist - so looking forward to having a copy, it looks just delicious! Books and it is a very sweet and yummy looking book by a very sweet Koralee!! You my friend are just so SWEET and such a blessing to me...a million thanks for such encouraging words! I am soooo pleased you like it..I am still waiting for my copy!!! Believe it or not I have not seen a hard copy yet. I think my copies got lost in the mail! You photographed it beautifully...making it look so much better than it really is! Hugs for a great day...you made mine...I am running out the door... Kindergarten is calling me! HUGSx100! Isn't it absolutely special to have a friend through blogging that is like you?! Love it! Enjoy your new read! I must have been living under a rock! I really need to do more blog reading. Shame on me. Koralee is precious and I had no idea she has written a book. I can hardly wait to take a peek. She is so creative! Enjoy your sunshine dear friend.